This book provides a nuanced and timely contribution to the question of vulnerability in police custody. 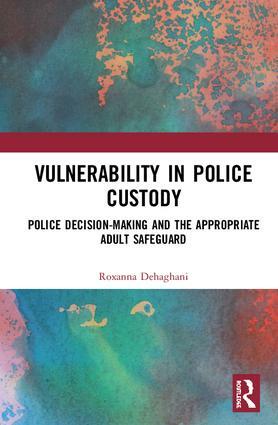 It addresses the implementation of the appropriate adult safeguard in respect of adult suspects and explores police decision-making in this context. Drawing on empirical research carried out in England, the work takes a socio-legal approach to examine how and why police custody officers implement or not the appropriate adult safeguard. The book’s core arguments are addressed within three parts. Part I examines how vulnerability is constructed philosophically and practically, firstly within the broader literature, thereafter at common law and in statute, and finally by police custody officers. Part 2 discusses how vulnerability is identified and how decisions are made in response to vulnerability. Part 3 critically assesses the theoretical understandings of police decision-making and criminal justice. Here it is argued that current theories on police decision-making hold explanatory power yet have significant shortcomings in relation to vulnerability and the appropriate adult safeguard. The book thus presents new theoretical insights and, on the basis of these insights, asserts that the current regime of regulation must be reconsidered, while police compliance may only be ensured if vulnerability is radically reconceptualised. 1. The (Vulnerable) Suspect in the Criminal Process 2. Police Powers and Procedures: ‘Safeguarding’ The (Vulnerable) Suspect 3. Police Custody: Getting Inside, Being Inside, Getting Onside, and Being Onside 4. Constructing Vulnerability – The Concept 5. Constructing Vulnerability – Pace, Code C and the Courts 6. Constructing Vulnerability – The Custody Officer Approach 7. Identifying Vulnerability in Police Custody 8. Implementing the Appropriate Adult Safeguard 9. Comprehending the Custody Officer Approach 10. Reconceptualising Vulnerability? Dr Roxanna Dehaghani is a Lecturer in Law at Cardiff School of Law and Politics, Cardiff University, Cardiff, UK.